As I’ve mentioned multiple times, part of our attraction to Cornwall was the food we’d get to eat. The region may not be Britain’s breadbasket per say, but it certainly holds claim to being the supplier of marvelous ingredients to some of the nation’s best restaurants. And appropriately, it has some pretty fantastic restaurants itself. After gorging ourselves in Penzance for a few days, we got on our way to Bristol, but on the advice of the only kind of travel pamphlet we needed, the Bon Appetit guide to Cornwall, we made a significant detour from the main route, back into the hedges of the rural roads, and to a different part of the coast. 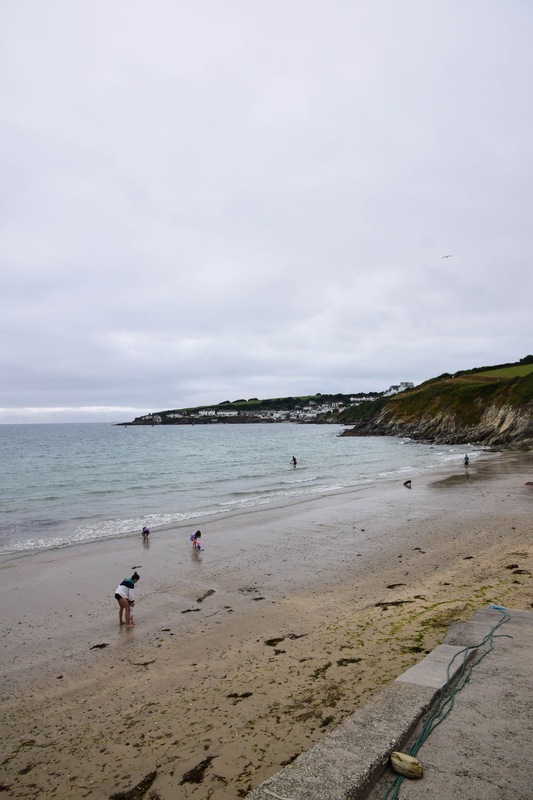 Porthcurnick isn’t the best known part of the Cornish coastline by any measure. However it does boast one of the buzziest restaurants in the country right now. A beachside hut, hidden from all but those who seek it — or some who magically stumble upon it, I suppose. 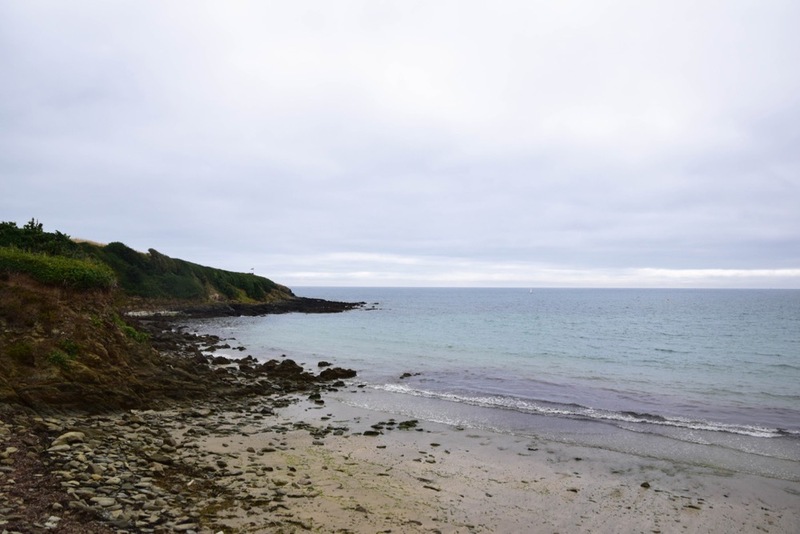 A plan is typically suggested for eating at the Hidden Hut though, as even our Airbnb host in Penzance had heard of its popularity despite never having been herself. With that in mind, we timed our arrival perfectly to get there just before lunch service started. 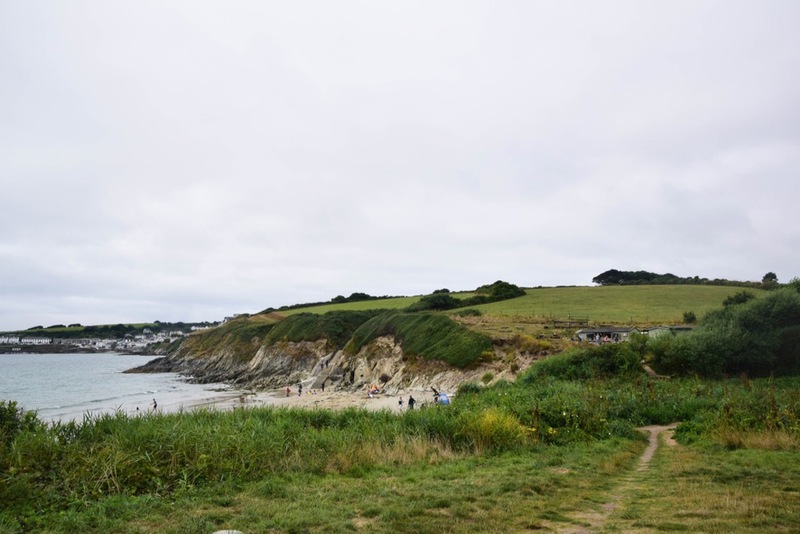 We parallel parked at the bottom of a steep and narrow road, which after being nothing but hedges for miles leading up to its conclusion, turned into a panoramic boat ramp leading down to a picturesque beach. To the right, on top of the hill overlooking the beach, a low slung hut. But look closer and it was actually a few huts, with an outdoor kitchen in the middle and a couple of smokers out back. We’d arrived. Our timing hadn’t been as perfect as we’d thought though. One of the presumed perks to living and cooking on the beach daily is that your schedule is a little more lackadaisical. What I’m saying is while we did beat the crowds, we showed up 30 minutes early to lunch service starting — but that turned out to be the best possible scenario, because it gave us an excuse to whet our appetites with the tea and coffee service on offer, with pastries. Pastries like the bread pudding, made of yesterday’s leftover pain au chocolat and pain au raisin. 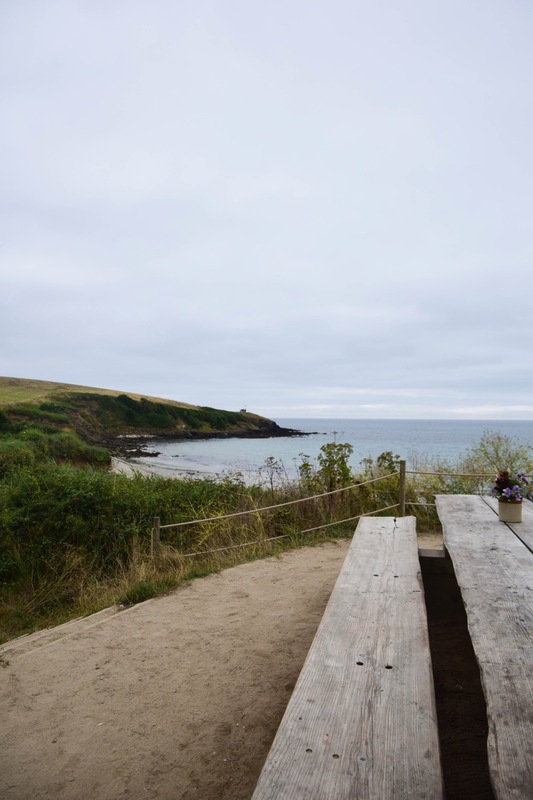 This we ate and moaned over while marveling at the view and the location. As lunchtime rolled closer and closer, we watched as a steady stream of people trickled down from either horizon, making their way to the only true destination for miles around. By the time the day’s menu was revealed on the chalkboard, a small crowd of a few dozen or so had formed. The reveal of the offerings was enough to start people jostling for position where the line would form. Everyone was very polite about it, of course, because that’s the beauty of the British, but they knew exactly what they were doing. I did not know exactly what I was doing, but I did go to the counter with an order written down. Our picks: the chorizo and squid stew for me, the dhal for Lia, and the tomato soup for us to share, because I couldn’t not get it after driving all this way. Two of these also came with bread, which is shorthand for saying we were stuffed by the time we finished — or not finished, because we had leftovers. Soup and dhal which we consumed for breakfast the next day, blowing my grandparents’ minds. By the time we were waddling back to the car, the whole place was packed. There was an additional long table crammed with people to my right which I didn’t get in the frame. This was on a weekday. I think. I lost track of the days to be honest. 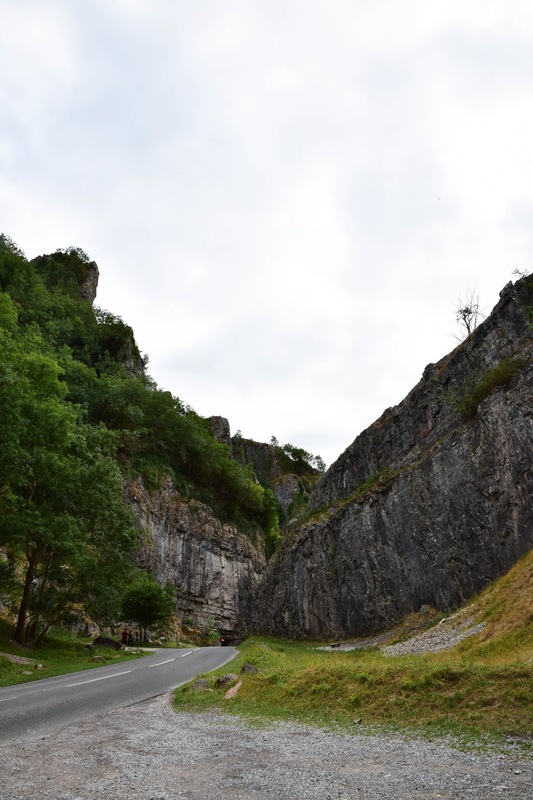 Further along route we stopped at the Cheddar Gorge, because I didn't remember ever seeing it before. We found it cost much money to climb the famous lookout point trail, so instead we just decided to drive through it, and pull over at a convenient spot to avoid having to pay for parking while we looked around. Lia found a cave which may or may not have contained aging cheddar, but she seemed very proud of it. Then the roles were flipped for once, as I was smol in the cheddar gorge. I’m for scale!